Visitors are always welcome. A contribution of £3 is requested. click here for Gallery photos. Our meeting was held on 4th April and we welcomed 4 visitors. Sue Schofield, Parish Councillor and Chair of the project to erect a memorial statue to remember the lives of the St Martins miners, also attended to answer any questions on the proposed memorial. It was our Spring Show and she very kindly presented the trophies to the winners of the various categories. The winner of the preserves was Helen Williams, The winner of the cookery was Ann Sadler, the winner of the floral was Ann Sadler. Handicrafts was jointly won by Joyce Sands and Helen Williams. Overall show winner with the most points was Ann Sadler. Best in show was Alice Wilding and best in floral was Morfydd James. We had a wonderful selection of entries so well done to all who took part. Our speaker for the evening was Gillian Sturgess of Chimes Cakes. She demonstrated how to make animal characters using a Cadbury's Creme Egg. There was a chicken, a rabbit and a sheep. She made it look so easy and the results were amazing. Then we all had a go! Well it wasn't quite as easy as we thought but we did our best and I must admit there were some stunningly good results. Well we won't mention the bizarre looking sheep (mine). At the end Gillian gift wrapped them in cellophane with a bow so they could be given as Easter gifts and they looked really good. Gillian was thanked by Myfanwy Dulson. Our next meeting on May 2nd we will be visiting the Derwen College to see behind the scenes. New members and visitors are always welcome. At our meeting held on 7th February we sang Jerusalem and The National Anthem to commemorate the Queens 65 year Jubilee of her ascension to the throne, a unique achievement! Our speaker was Sue Dewhirst who spoke about Cardiac Risk in the Young, the charity is called CRY. The condition is also known as Young Sudden Cardiac Arrest or YSCD. She got involved because her 17 yr old son died of this condition as he took part in a fitness session at his college. She has since learnt a great deal about the condition and speaks and supports many events that raise funds for the charity. They raise awareness and provide subsidised testing for 14 - 35 yr olds. Testing cannot be done at younger ages since the heart has not stopped growing and can give false readings. A great many of us had not realised the statistics - every week in the U.K. 12 apparently fit and healthy young people under 35 die from undiagnosed cardiac conditions. She was one very brave and inspirational lady and we learnt such a lot from her talk that evening. I urge anyone with 14 to 35 yrs olds in their family to consider having them tested through this charity. We have had invitations to several outings including one from our Oswestry North Group for a coach trip to Well Dressing at Tissington in Derbyshire on 26th May 2017. We also discussed our own outing on 1st August to Gregynog Hall Gardens. Next month we will not have our meeting at The Miners Institute, instead members will be going to Oswestry to the cook-ware shop, Upstairs Downstairs for a demonstration of Italian cooking and a tasting afterwards, sounds yummy. You can follow us on Facebook at www.facebook.com/StMartinsWI/ New members are always welcome. Members and friends enjoyed our annual Christmas meal on the 1st December at The White Lion, Whittington. The newsletter was distributed and read. President Shirley Willis reminded us of the carol service on 7th December at Whittington. The exhibition Cup was won by Alice Wilding, 2nd was Isobel Banham, 3rd was Myfanwy Dulson. The Competition Cup was won by Shirley Willis, 2nd was Alice Wilding, 3rd was Ann Sadler. The winners also received a £10 Marks & Spencer gift voucher each. Myfanwy Dulson said grace and after dinner we had a quiz. The raffle proceeds will go to St Martins First Responders. At the end of the evening Shirley thanked everyone for their help during the year and for voting her as President again for 2016. She wished us all a Happy Christmas and New Year. Our October meeting was held on the 6th with Shirley Willis presiding. We first had a talk by Andy Rimmer from the "Big Local" which was set up by "The Big Lottery" fund and is managed by Local Trust. He told us what it was doing in the 3 villages that are involved in it. How various groups had got grants through the "Big Local" and how that money was being used. He asked us to think of any projects that could help our community that the "Big Local" could help with. He distributed leaflets. He was thanked by Shirley Willis. Our meeting then went on to discuss our W.I. newsletter. We had an invitation to Criftins W.I. to an open evening on 13th October. Names were taken for our Christmas meal at The White Lion on 1st December. To date we are doing well selling our new Centenary Recipe book and if anyone would like a copy they can still be had from our president Shirley Willis. Our speaker for the evening was Penny Vingoe who showed us how to make Christmas crackers. This produced some quite good examples and shall we say some more interesting variations. Not naming any names but my effort wont find itself on the Christmas dinner table!!! Anyway we all had great fun doing it. She was thanked by Myfanwy Dulson. The competition for a Christmas cracker motto was won by Pam Doyle, 2nd was Ruth Dean, 3rd was Shirley Willis. The exhibition of a Christmas decoration was won by Sheila Buchanan, 2nd Alice Wilding, 3rd Sue Stevens. On 3rd November our speaker will be Summer Wynne showing us how to make a Christmas wreath. New members and visitors are always welcome. St Martins W.I. did not have a meeting in August, instead about 15 members and friends went on a coach outing to Stoneyford Cottage Gardens and Nursery. We enjoyed a conducted tour by the owner who had started the garden 30 years ago, this was followed by a nice lunch. Some members bought plants from the nursery. The trip was enjoyed greatly. On 1st September we held our meeting and our Autumn Show. We also celebrated the W.I. 's 100 anniversary with a celebration cake and wine. Our Centenary Recipe Book was displayed and sold for the first time. Our President Shirley Willis welcomed everyone and we sang Jerusalem. Pam Doyle thanked Shirley on behalf of members for the special effort she put into the 100 yrs celebration, making our cake and steering the recipe book to completion. In turn Shirley thanked all those who contributed to and helped put together the recipe book. She thanked also all those who took part in Oswestry Show, photos were on display in the room. A presentation of Centenary W.I. badges was made to all members. Our speaker was Mr Andy Jones talking of his memoirs of serving on the Royal Yacht Britannia. He gave us some insights into the grand banquets that took place, and the Heads of State and famous people he served aboard her. He also gave us details of the fabulous silverware and precious objects used in the banquets. He had many happy memories of his time serving the Royal Family. He was thanked by Jean Lunt. The presentation to the winners of cups for our Autumn Show was as follows:- Preserves Cup to Isobel Banham, 2nd Paula King, 3rd Joyce Sands. Cookery Cup went to Ann Sadler, Joint 2nd Jean Lunt and Isobel Banham, Joint 3rd Shirley Willis and Rita Jowett. Floral Rose Bowl to Morfydd James, 2nd Shirley Willis, 3rd Ann Sadler. Vegetable and Produce Cup to Joyce Sands, 2nd Ann Sadler, 3rd Sheila Buchanan. Handicrafts Rose Bowl to Rita Jowett, 2nd Jill Dougbe Penny Vingoe, showing us how to make Christmas crackers. Visitors are welcomehty, 3rd Morfydd James. The Margaret Taylor Vase for best in crafts was won by Rita Jowett. The Challenge cup was won by Ann Sadler. 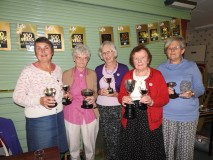 The Overall Winners Cup on total points went to Joyce Sands, 2nd Ann Sadler, 3rd Isobel Banham. Total of all entries was 133. Our next meeting will be on 6th October in the Miners Institute at 7.30 p.m. The speaker will be Penny Vingoe, showing us how to make Christmas crackers. Visitors are welcome. At our meeting on 7th July President Shirley Willis welcomed everyone. We discussed a number of invitations for outings and events we had received. Myfanwy Dulson gave us final details of our own outing taking place on 4th August to Stoneycroft Gardens. Names were taken for our Group Annual Meeting at Whittington W.I. on 23rd September and 16 members will attend. Centenary Badges have been ordered for all our members. Our Centenary Cook book will hopefully be ready early September and we will be able to sell this during September. The proceeds will go to a charity. Ann Sadler gave a report and showed photos of her wonderful day at the Royal Garden Party at Buckingham Palace to celebrate the W.I. 's 100th anniversary, she was suitably impressed by the Royal Party who mingled and spoke to many people. She wasn't the only one to have been in the presence of Royalty, we had a report and photos from our President Shirley Willis who was our delegate to the Annual General Meeting at the Royal Albert Hall. This was attended by The Queen, Princess Ann and The Countess of Wessex. Shirley said she had felt very privileged to be there on this special Centenary meeting. Our speaker this evening was Barbara Maitre, she spoke and showed slides about her life in India where she lived for 15 years. As the English wife of an Indian in the 1950's she learnt a new language and adapted to a new culture. She is a writer and she uses her Indian experiences in her stories. She was thanked by Alice Wilding. Our competition of a single rose was won by Sue Stevens, 2nd Jean Lunt, 3rd Shirley Willis. The exhibition of something Indian was won by Barbara Aston, 2nd Debbie Saw, 3rd Shirley Willis. Our speaker for September 7th will be Andy Jones on Memoirs of the Britannia. This will also be our Autumn Show event. At our meeting on 2nd June President Shirley Willis welcomed everyone. The newsletter was read and various events discussed. 3 people will attend the Food Storage and Transportation event on 10th September. Pam read out Ann Sadlers report on the Annual Meeting at the Theatre Severn on 6th May. Names were taken for the Steam Rally to man the stall and to make cakes. Information about a free First Aid Course to be held in St Martins on 14th and 28th June was read out. We need a cover for our forthcoming recipe book, anyone interested have their ideas ready to show at our July meeting and we will choose one. Angela will host another Oswestry Show meeting at her house on 9th June. Angela also gave us an account of her day attending a Royal Garden Party at Buckingham Palace. It was decided that we will have wine and cake at our September Autumn show meeting to celebrate the 100th anniversary on 16th September of the start of the W.I. West Felton W.I. has invited our members to go on their August 22nd trip to Hereford, cost £23.50. Joyce Sands informed us of a commemoration of 800 years of the Magna Carta to be held on 14th June, tickets £5. Our speaker for the evening was Dorothy Nicholle, a Blue Badge guide in Shrewsbury. Her talk was called "don't you know there's a war on", in which she told of how the 2nd world war impacted on Shropshire and its people. She was thanked by Shirley Willis. After tea the parcels for the Derwen fete on 4th June were wrapped. The competition of a war time recipe was won by Debbie Shaw with Jean Lloyd 2nd and Alice Wilding 3rd. The exhibition of an old cookery book was won by Alice Wilding with Gwyneth Morgan 2nd and Ruth Dean 3rd. Our next meeting will be on July 7th and the speaker will be Barbara Maitra speaking on "Passage to India". Our President Shirley Willis welcomed everyone to our April meeting and a thank you letter from Derwen College was read. Mrs Alice Wilding gave a very interesting report on her course at Denman College on Quilting which she successfully applied for as a first timer bursary. She said food, accommodation and the whole experience was excellent and she would recommend anyone to go on a course. After various upcoming events were discussed, a vote was taken on how our delegate Shirley Willis should vote on our behalf on the resolution at the Annual Meeting on 4th June 2015. Members attending the Annual Meeting at the Theatre Severn on 6th May were given their tickets. After everyone had read the letter about the Buckingham Palace Garden Party, to which only 1 member from each W.I. may attend, all those interested put their names forward into a draw. The lucky ladies' name that was drawn out was Mrs Ann Sadler who was extremely happy and will now attend on 2nd June. The remaining problem for her is "What To Wear" and I am sure she will enjoy solving the problem! Our speaker for the evening was Marcia Meredith on creative folding. After telling us how she got interested in this art she gave us all a book to fold and we all made a paper hedgehog. Her instructions were easy to understand and before long we were all folding and gluing. We all made very passable hedgehogs, and had a lovely time doing it too. She was thanked by Alice Wilding. The winner of our competition of flowers in a jam jar was won by Shirley Willis, 2nd Alice Wilding, 3rd was Ann Sadler. The exhibition of a favourite book was won by Shirley Willis, 2nd Isobel Banham and 3rd Alice Wilding. Next Month on 5th May our speaker will be Pam and Les Watkins "Life On The Road". Visitors are always welcome, meetings are at The Miners Institute, St Martins at 7.30 pm on the first Tuesday of the month. President Shirley Willis welcomed everyone to our meeting on 7th October including 2 visitors June and Barbara. The newsletter was read and discussed. Shirley gave reports on The Oswestry Show and The St Martins Annual Show and thanked everyone for their efforts. The Parish Plan was passed around for members to read and give feedback on. We congratulated Alice Wilding on her success at getting a First Timer bursary to attend a course at Denman College. Pam Doyle passed on information to members about St Martins now having Fibre Optic Broadband available for the first time. The Christmas Meal menu was passed around for members to select from. This will be at The White Lion Whittington on 2nd December. On behalf of Contact the Elderly we will be holding a Tea Party for the elderly in St Martins on 16th November. Any elderly person who would like to get in touch with Contact The Elderly can do so on Freephone 0800 716543. Nominations were taken for members to serve on next years committee. Our speaker for the evening was writer Judy Arliss from Shrewsbury who spoke of her life as a Nun, before, during and after. She is now a married lady with a daughter. Her interesting story told of the how she became a Nun and the hard life they had, however this was tempered by some very funny incidents too. Our competition of a pot plant was won by Shirley Willis with Isobel Banham 2nd and Jean Lloyd 3rd. The exhibition of a pretty necklace was won by Angela Ree with Joyce Sands 2nd and Shirley Willis 3rd. The mystery prize was won by Emma Sands. Our evening finished with Blind Whist. Next months meeting will be on 4th November and our speaker will be Mr Robert Adams on "The charms and curiosities of the Shropshire Lanes". We meet in The Miners Institute lounge at 7.30 p.m. new members are welcome. At the meeting held on 1st July President Shirley Willis welcomed everyone including 2 visitors Debbie Shaw and Catherine Broster. After the newsletter was read Secretary Pam Doyle read a report from our Link delegate Jackie Wyatt of Gobowen W.I. who attended our A.G.M at Leeds on our behalf. We have received our invitation from West Felton W.I. who will be hosting our annual Group meeting on 17th September, the speaker will be Karen Van Hoff who designs beautiful jewellery and tiaras. Approx 18 members so far have said they will attend. We had various other invitations to open meetings at other W.I. 's and also to two Flower Festivals, September will be a very busy month I think as we are also going to be involved with the St Martins Grow It, Make It, Show It show on 27th September. Our August outing this year will be to Salford Quays on 5th August, so there will be no meeting of the W.I. at the Miners Institute in August. At our sandwich, cake and tea stall at the steam rally at Park Hall on 14/15th June we raised £800 for each of the two groups running the stall, this is our main fund raiser of the year. Shirley thanked all those who worked on the stall or baked cakes for their hard work. Our speaker for the evening was Linda Arthan her theme was "Living the Dream" and she gave a talk and slide show on her time when she carried the Olympic Torch through Oswestry for the 2012 Olympics. Also various aspects of her sporting life as a triathlon representing Great Britain and her time as a teacher. She was a very inspirational speaker with such enthusiasm and we enjoyed her talk immensely. Our mystery prize was won by Joyce Sands and our competition of a photo of a pet was won by Ruth Dean, 2nd Jean Lloyd, 3rd Angela Ree. Our exhibition of an ornament of an animal was won by Ruth Dean, 2nd Emma Sands, 3rd Morfydd James. The next meeting of St Martins W.I. will be on 2nd September and the speaker will be Mrs Jessica Pannett talking about "Colour in the Winter Garden". Meeting starts at 7.30 pm at the Miners Institute, visitors and new members welcome. At the W.I. meeting on 3rd June Shirley welcomed everyone including visitor Cristal Bamfield. The newsletter and other letters were read. Shirley Willis announced that our W.I. stall at the Derwen Fete raised the sum of £156. The Fete as a whole raised over £11,000. Myfanwy Dulson gave her report after attending as our delegate at the Annual Spring Meeting of the Shropshire W.I. Federation at the Theatre Severn. There were 5 members who attended in total and it was a very enjoyable day with 2 very interesting speakers. Myfanwy also gave us some ideas for our August outing and after a vote it was decided we would go to Salford Quays for the day on 5th August. Shirley presented 3 more Food Hygiene certificates to Angela Ree, Shiela Buchanan and Paula King, they have passed the course held at Shrewsbury Head Office. A list was taken of members who can help out and make cakes for the Steam Rally on 14th/15th June. Our speaker for the evening was Mrs Summer Wynn. She demonstrated her skills as a flower arranger and made 5 beautiful arrangements which she gave as our raffle prizes. They were won by Jean Lunt, Isobel Banham, Cristal Bamfield, Paula King and Shiela Buchanan. The competition of a flower arrangement in a tea cup was won by Julia Griffiths with Angela Ree 2nd, 3rd was Rita Jowett. The exhibition of a vase was won by Paula King, 2nd Isobel Banham, 3rd was Helen Williams. Our next meeting will be on 1st July at the Miners Institute at 7.30 p.m. our speaker will be Linda Arthan "Living The Dream". She was an Olympic Torch carrier in the 2012 Olympics. New members and visitors always welcome. Our President Shirley Willis welcomed everyone to our 1st April meeting which was also our Spring Show event. Letters were read, one from The Derwen thanking us for our sponsorship, and invitations for events at neighboring W.I's. Also from the National Federation with postcards for members to use to to send off to Parliament to encourage a Bees Action Plan. The Shropshire Annual Report and the National Federation Annual Review were made available to members. A vote was taken on the resolution to Increase Organ Donation and was supported by a large majority. A number of our members will be doing our section of the Shropshire Way Walk on 29th April to celebrate Shropshire Federations 95th birthday. Sheila Buchanan informed us of Prize Bingo at the institute on 19th April in aid of cancer research. Myfanwy Dulson collected donations for the Derwen Fete stall. Shirley Willis gave a report on the Inspiring Women meeting at Chester and on the Oswestry Show meeting. She thanked all members for taking part in our Spring Show and we had 151 individual items entered, amazing for a small W.I. such as ours. Whittington W.I. kindly supplied 4 judges and they did a wonderful job for us. The Preserves section was won by Isobel Banham, 2nd Ruth Dean, 3rd Paula King. Cookery was won by Shirley Willis, joint 2nd was Ann Sadler & Ruth Dean, 3rd Isobel Banham. Floral section was won by Morfydd James, 2nd Helen Williams, 3rd Alice Wilding. Handicrafts section was won by Rita Jowett, 2nd Ruth Dean, 3rd Helen Williams. Overall winner was Ruth Dean. The Best In Show was won by Pam Doyle. The cups were presented to the winners and a group photo was taken. Our members gave themselves a round of applause for a great effort and agreed it had been one of our most successful shows and was enjoyed by us all. The evening ended with a quiz. Our next meeting on 6th May we will be having as our speaker Julia - Toots Sweets "Chocolate". New members and visitors always welcome. Our President Alice Wilding welcomed everyone to our June meeting. We were informed that the resolution at the AGM concerning the demise of our high streets and the new amendments to our constitution were voted on and passed. Our 85th Birthday certificate has now been nicely framed, it is an achievment that our St Martins branch has been going for such a long time, we hope it will continue to thrive. We were informed that a sum of £165 had been raised at the W.I. stall at the Derwen Fete. Our speaker for the evening was Catherine Galliers who gave a very entertaining and informative talk on Patchwork & Quilting. She brought along many samples of her work and demonstrated how she cut the material, all the while telling of amusing things that had happened to her. She had some of our members "in stitches" if you will pardon the pun! Our competition of 3 biscuits was won by Alice Wilding. She also won the exhibition of a glass ornament with Shirley Willis 2nd and Isobel Banham 3rd. The mystery parcel was won by Julia Griffiths. Next month our speaker will be Lynda Worthy and will talk on jewellery care and show a selection of Pierre Lang jewellery which will be available to buy. New members and visitors are always welcome, we meet the first Tuesday of the Month at 7.30 p.m. at The Miners Institute in St Martins. At the W.I. meeting held on 7th May President Alice Wilding welcomed all members. A vote was taken on the W.I. resolution on the demise of our High Streets which will be presented at our AGM at Cardiff on 1st June 2013. Mrs Shirley Williis gave a report on the Spring Council Meeting she attended as our delegate which was held at the Theatre Severn. She brought back with her our W.I. 's 85th Birthday Certificate which was presented at the meeting. We will now get it framed. Our speaker for the evening was Ruth Vintr, she and her mother Joy gave us a very interesting talk on making jewellery from pieces of reclaimed vintage ceramics e.g. cups, saucers etc. They told us how the business got started when they spotted someone throwing old pieces of pottery into a skip and couldn't bear the thought of it being wasted as the patterns were so lovely. We were able to examine some lovely pieces they had made and some were available to buy on the night. Our competition of a home made cushion was won by Sheila Buchanan with Morfydd James 2nd and Alice Wilding 3rd. Our exhibition of "my attic find" was won by Shirley Willis, with Morfydd James 2nd and Emma Sands 3rd. Our mystery parcel was won by Shirley Willis. After tea we had a further meeting to discuss the new St Martins Annual Show which will take place on 28th September. It was decided by our members that we would take part and support this new village endeavour and that Mrs Alice Wilding would attend the meeting on the 8th to put forward our schedule in the cookery, preserve and craft sections. A collection was taken for parcels for the W.I. stall at the Derwen Fete. Names were taken for the Sabrina Cruise in September to celebrate our 85th Birthday. speakers for the evening, Ian & Pam Toothall from The Owl Rescue Centre at Corwen. Ian gave a very informative, but easy to understand, talk about the various types of owl and the reason they look so very different is all down to what prey they catch, what time of day they hunt and the locations they hunt in. They had 3 owls with them, all different, and we were able to handle them to everyone's enormous pleasure. We also had an opportunity to take photos as these 3 owls were very tame. Our competition of 5 daffodils was won by Mrs Pam Doyle with Morfydd James 2nd and Vicky Crane 3rd. The exhibition of a favourite ornament was won by Mrs Shirley Willis with Sue Stevens 2nd and Pam Doyle 3rd. The mystery prize was won by Mrs Sue Stevens. After tea and biscuits instead of our usual social time we had a short further meeting to discuss our arrangements to celebrate our W.I's 85th birthday which falls in September this year. We are all looking forward to this, it would be nice if we had even more new members to celebrate with us. Call 01691 777034 if you would be interested in joining. Mrs. Alice Wilding presided at the March meeting. The newsletter was read and six members booked at attend a visit to Whixall Moss. It was agreed to sponsor a student on the Derwen Walk. The group meeting will be held this year at St. Martins as well as the group Carol Service. The speaker was Malcolm Whittall who showed members how to draw famous faces cartoon style. He was thanked by Helen Williams. The competition of the best drawing by a member was won by Myfanwy Dulson. The exhibition of a funny postcard was won by Helen Williams. The mystery parcel was won by Jean Lunt. Mrs Alice Wilding presided over our meeting held on the 5th February. She welcomed everyone and read the newsletter. Members were asked if they wished to attend various events throughout the year. Our speaker for the evening was Mr Martin Carruthers who gave a talk and slide show on "The Intrigue of Diamonds" from mine to store window. He gave us the history of diamonds and how the mines were developed and then went on to show us slides of famous diamonds throughout history and Royal gems. He was thanked by Alice Wilding. The competition of homemade Valentine card was won by Alice Wilding. The exhibition of "a favourite ring" was won by Sue Stevens. The mystery parcel was won by Isobel Banham. The evening ended with games of dominoes. New members are very welcome, and visitors can come and see if they like us before they join. Members and friends enjoyed the annual Christmas party which was held at the Hand Hotel, Chirk. Grace was said by Mrs. Joyce Sands. Arrangements were made for the Group Carl Service. The exhibition cup was presented to Shirley Willis and the competition cup to Alice Wilding. It was agreed to donate the proceeds of the raffle to the Histiocytosis Research Fund. The evening ended with a quiz arranged by Mrs. Sue Stevens. Next month’s meeting will be on 8th January when the competition will be a slice of Christmas cake and the exhibition a Christmas card of a winter scene. President Alice Wilding welcomed members at the November meeting. Final arrangements were made for the Christmas Party. Shirley Willis gave a report on the Oswestry Show meeting she had attended. The speaker for the evening was Mr. Frank Triggs who showed slides on wood sculpture. He was thanked by Shirley Willis. The competition of the prettiest parcel for Dolywern was won by Alice Wilding. The exhibition of a home-made wooden ornament was won by Isobel Banham. Ann Sadler won the mystery parcel. At the following AGM, secretary Jean Lunt gave a report on the previous years activities, Alice Wilding thanked members for their support during the year and Helen Williams, treasurer, gave a report on the finances. The new committee was announced. Two new committee members, Ann Sadler and Angela Rae were welcomed. Alice Wilding was unanimously re-elected president. Pam Doyle will take over as secretary. Cup for the most points in show – Mrs. Ann Sadler. Mrs. Alice Wilding won the mystery parcel. Alice Wilding presided at the July meeting. Members stood in silence in memory of Mrs. Kay Aukland who had recently passed away. Members were thanked for the cakes and help at the Steam Rally. Paula and Roger King were congratulated on their 50th wedding anniversary. The speaker for the evening was Julia Baron who showed slides on walking in Macchy Picchu. She was thanked by Alice Wilding. The bus for the mystery trip in August will leave the village at 6 p.m. The competition of a single rose was won by Alice Wilding. The exhibition of a rose vase was won by Shirley Willis. The mystery parcel was won by Vicky Crane. Mrs. Alice Wilding presided at the June meeting. Myfanwy Dulson gave a report on her visit to the AGM in London as delegate. Show schedules were given out for the September meeting. The August outing will be an evening mystery trip followed by a meal. The speaker for the evening was Mrs. Jennie Lack who showed slides and talked about her work with the Brook Charity. She was thanked by Pam Doyle. The competition of homemade biscuits was won by Alice Wilding and exhibition of something new out of something old was won by Morfydd James. Mrs. Ann Sadler won the mystery parcel. Alice Wilding presided at the May meeting welcoming members of Gobowen WI. The newsletter was read. Also correspondence from West Felton WI and Ifton Meadows Committee was read..
Alice Wilding presided at the March meeting. Mrs. Newborough and Ann Sadler were welcomed as new members. A letter of thanks was read from the DerwenCollege. The Group Meeting was discussed. Members were asked for ideas for the entertainment. The speaker was Mrs. Ann Smith who was dressed in Tudor costume. She spoke on all aspects of Tudor life. She was thanked by Margaret Chapman. The competition of five daffodils was won by Isobel Banham and the exhibition of an old brooch was won by Emma Sands. The mystery parcel was won by Pam Doyle. The evening ended with blind whist. This year we have a new president, Alice Wilding. raffle held at the December party. Morfydd James was thanked for printing the 2012 programme. time was bingo organised by Jean Lunt. suit) will be the speaker. Wilding with Sue Stevens second and Joyce Sands third. Social time was spent playing dominoes. Members are now busy working on their entry at Oswestry Show. At our last meeting Angela Ree and Pauline Laycock were welcomed as visitors. Final arrangements were made for the tea party we are holding for members of the Contact the Elderly group. Transport was arranged for our Christmas Party at the Red Lion, Ellesmere next month and members were reminded to bring a gift for the lucky dip. It was decided that from January meetings would start at 7.30pm instead of 7.15. At the following AGM Isobel Banham - secretary, Helen Williams - treasurer and Jean Lunt President all gave their reports on the previous years activities. The new committee was announced and jobs allocated. Mrs Alice Wilding was elected as President. In the absence of the speaker members made Christmas wreaths from materials they had brought with them. The mystery parcels were won by Angela Ree and Rita Jowett. The prettiest parcel competition for a Christmas gift donated for a resident at the Dolywern Cheshire Home was won by Pam Doyle with Shirley Willis second and Jean Lunt third. The exhibition of a Christmas tree decoration was won by Alice Wilding, Pam Doyle was second and Shirley Willis third. At the last meeting President, Mrs Jean Lunt, thanked Myfanwy Dulson for arranging the outing in August to Eardisley which everyone had enjoyed. A letter of thanks was read from the Chirk Scanner Appeal secretary for the donation of the proceeds from our stall at the village fete. Members who had contributed to the excellent entry at Oswestry Show were thanked for all their hard work. Ten members will be going to Group Social on 21st September at Whittington. Pam Doyle will thank the hostesses and Alice Wilding the speaker. The competition for 3 tomatoes was won by Helen Williams with Alice Wilding second and Shirley Willis third. The exhibition of a quirky ornament was won by Pam Doyle, Joyce Sands was second and Helen Williams third. The mystery parcel was won by Shirley Willis. Our next meeting will be held on October 4th when Malcolm Whittall will be holding a cartton workshop. Meetings are held in the lounge bar of the Miners Institute at 7.15pm, new members and visitors are always welcome. At our last meeting Paula and Corinne were welcomed as visitors and members were reminded that the coach for the August outing would be leaving at 9am. Jean Lunt, President, thanked everyone who had made cakes and helped at the Vintage Rally. She also thanked members who had helped with the stall at the Village Fete and it was decided to donate the proceeds from that to the Chirk Scanner Appeal. Final arrangements were made for the Oswestry Show competition. The speaker for the evening was Patrick Pearson who demonstrated the Alexander Technique and discussed the benefits of this technique on our bodies. He was thanked by Isobel Banham. The competition of a single rose was won by Shirley Willis with Sue Stevens second and Alice Wilding third. The exhibition of a vase for a rose was won by Helen Williams, Shirley Willis was second and Margaret Chapman third. The mystery parcel was won by Jean Lunt. The next meeting will be held at 7.15pm on the 6th September in the lounge bar of the Miners Institute when Chris Symes will be showing slides of Travels on a Motorbike. At our last meeting Myfanwy Dulson was thanked for buying and wrapping the parcels for the W I stall at the Derwen Fete and Pam Doyle and Margaret Chapman were thanked for helping to man the stall. Over £140 was raised. It was agreed that a letter would be sent to the Clerk of the Parish Council supporting the proposal for a new sports court in the village. Members were reminded that we will be having a stall at the Village Fete on July 2nd and that donations and helpers will be required. Maxine Betts from the Commumity Council for Shropshire gave a short talk and presentation on the leisure needs of our village and asked for suggestions from members. Final arrangements were made for the Steam Rally next weekend and names were taken of members going on the August outing. The speaker for the evening was Anna Burgess of Alvanatural Products. We were all able to sample the various creams and she was thanked by Pam Doyle. The competition of a photograph of a child was won by Margaret Chapman, second was Helen Williams and third Morfydd James. The exhibition of a pretty perfume bottle was won by Pam Doyle with Emma Sands second and Helen Williams third. The raffle of an Alvanatural gift pack was won by Isobel Banham and the mystery parcel was won by Sue Stevens. Our next meeting will be held in the lounge bar of the Miners Institute on July 5th when Patrick Pearson will be demonstrating the Alexander Technique. Visitors and new members are always welcome. Our last meeting was held on 3rd May when Joyce Spalding was welcomed as a visitor. Members will be helping to man the W I stall at the Derwen Fete and Myfanwy Dulson was thanked for buying and wrapping the gifts for sale. Alice Wilding gave her report on the Annual Council Meeting that she had attended as delegate. She had enjoyed the day, particularly the talk by Adam Henson from Countryfile and seeing the suit that had been made from wool from his own sheep. Five committee members will be going to the social evening being held in Gobowen on 17th May. We shall again be helping with refreshments at the Steam Rally at Park Hall and names were taken of members who can make cakes and help on the two days. The speaker for the evening was Sue Bradley who demonstrated Tea Time Treats. We all enjoyed her delicious small cakes and traybakes and she was thanked by Jean Lunt. The competition of a bookmark was won by Shirley Willis, second was Morfydd James and third Joyce Sands. The exhibition of an old cookbook was won by Alice Wilding, Myfanwy Dulson was second and Morfydd James third. The mystery parcel was won by Joyce Spalding. At the last meeting it was noted that the knitting project for the Olympics being held nationwide by the W I has been changed and new details will be announced later. Two members will be going on the evening ramble being held at Ifton Meadows on 20th June. A letter of thanks has been received from the Derwen College thanking members for sponsering a student in their recent Annual Walk. Donations were collected for gifts to be purchased for the W I stall at the Derwen Fete, Myfanwy will kindly buy and wrap them for us. Four members enjoyed afternoon tea and a chat with the residents at the Dolywen Cheshire Home. Members voted on the resolutions being put forward at the AGM being held in Liverpool in June. It was agreed that we will again have a stall at the St Martins village fete and will help with refreshments at the Steam Rally being held at Park Hall on 18th and 19th June. The annual outing this year will be to Eardisly village festival on 4th August, if anyone would like to join us please get in touch with any member of the committee for details. The speaker for the evening was John Palfreyman who spoke on the "History of Mystery". He amazed us with his magic and was thanked by Pam Doyle. The competition for 5 Daffodils was won by Shirley Willis with Vicky Crane second and Margaret Chapman third. 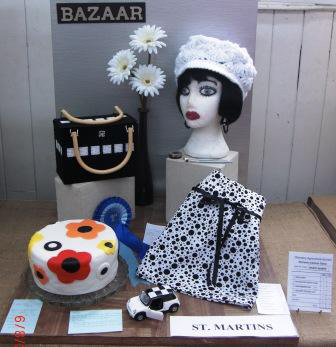 The exhibition of a top hat was won by Alice Wilding, Shirley Willis was second and Helen Williams third. The mystery parcel was won by Joyce Sands. The next meeting will be on May 3rd at 7.15pm in the lounge bar of the Miners Institute. There will be a cookery demonstration of "Teatime Treats" by Sue Bradley. At our last meeting members stood in silence in memory of Mrs Milda Derrick who had passed away recently. She had been a past member and treasurer for many years. Names were taken of members who would like to go to tea at the Cheshire Home Dolywern on 15th March. It was decided that we would once again sponser a student in the annual Derwen Walk and we will be helping to man the W I stall at the Derwen Fete. Sheila Buchanan was welcomed back following her operation and she thanked members for the card and flowers she had received. The speaker for the evening was Celia Todd who spoke on her travels to Australia and other countries and showed beautifull wildlife slides. She was thanked by Myfanwy Dulson. The competition of homemade shortbread was won by Rita Jowett with Jean Lunt second and Shirley Willis third. The exhibition of a pretty necklace was won by Helen Williams, second was Jean Lunt and third Morfydd James. On April 5th the speaker will be John Palfreyman on the History of Mystery....magic from 5000BC to the present time. At our last meeting held on 1st February Mrs Jean Lunt gave our congratulations to Joyce and John Sands on their 50th wedding anniversary and to Helen and Terry Williams on their 40th. A letter was read from the Chirk Hospital Scanner Appeal thanking us for the donation they had received from the proceeds of our Christmas Raffle. Alice Wilding will be our delegate at the Annual Council in Shrewsbury in April and names were taken of other members who were interested in going as visitors. An invitation has been received from the Cheshire Home at Dolywern for members to visit them, date to be arranged. The speaker for the evening was Dorothy Nicolle who gave a talk and slide show on 2000 years of Shropshire history, she was thanked by Helen Williams. The competition of a photograph of Shropshire was won by Rita Jowett with Alice Wilding second and Pam Doyle third. The exhibition of something old was won by Joyce Sands, Helen Williams was second and Shirley Willis third. At the first meeting of 2011 president Mrs Jean Lunt wished everyone a Happy New Year and welcomed a visitor for the evening.. It was noted in the County News that we had won £30 in the Claremont Club raffle, a nice start to the year. Jean thanked Morfydd James for producing copies of the year's programme and for the posters that she had put around the village. Members were reminded to vote for one of the resolutions in the W I Life magazine and to send it to County office before the end of January. A letter was read from the Dolywern Cheshire Home thanking members for the Christmas parcels and inviting us to visit them at some time, date to be arranged later. The speaker for the evening was Ann Jones, Group Convener, who entertained us with a Welsh evening consisting of music, a talk and a quiz. She was thanked by Myfanwy Dulson. The exhibition of a Christmas card was won by Joyce Sands with Morfydd James second and Alice Wilding third. The competition of a slice of Christmas cake was won by Shirley Willis, Helen Williams was second and Alice Wilding third. The mystery parcel was won by Sheila Buchanan and the evening ended with a game of bingo. Eighteen members and friends enjoyed our Christmas Party at Mad Jacks at Hindford. Mrs Myfanwy Dulson said the Grace and members stood for a minutes silence in memory of Mrs Elsie Young who had been a member for many years. Eight members enjoyed the Carol Service which was held at Weston Rhyn. It was decided that we would host a tea party for Contact the Elderly again next year and a date of 21st November was suggested. Mrs Vicky Crane was presented with a gift on her retirement from committee and thanked for all her hard work. The annual Exhibitions cup was won by Helen Williams with Alice Wilding second and Pam Doyle third. The Competitions cup was won by Shirley Willis, Helen Williams was second and Jean Lunt third. The proceeds of the evenings raffle amounting to £30 will be donated to the Chirk Hospital Scanner Appeal. Following dinner members enjoyed a quiz devised by Sue Stevens. The first meeting of 2011 will be held in the lounge bar of the Miners Institute at 7.15pm on January 4th when we will be having a Welsh Evening. This was the St Martins entry which gained joint second place in the table top category . The subject was Famous Women. If you can't work out who it was schroll down. It was of course....Mary Quant. Our first meeting of the year took place on 7th January and was presided over by our new President Mrs Shirley Willis who welcomed everyone including four new members who had joined that evening. Six of our members will attend the Food Hygeine Course that the W.I are offering, to gain their certificates so when we prepare food for sale to the general public there will always be a suitably qualified person attending. We will also be hosting a Tea Party for the Elderly once again this year on 16th November. Our speaker for the evening was Mrs Effie Cadwallader, she is one of three Community First Responders based in St Martins and gave a talk on the wonderful work they do. We were surprised that they provide a service officially within a 10 mile radius of St Martins but in fact can overlap other areas in emergencies too. She enlightened us on many aspects, one of which was apart from the formal training provided by West Midlands Ambulance Service and the provision and replacement of their main equipment, such as defibrilators, oxygen etc., they are responsible for paying for their own uniforms, boots, their large backpack, maps, torches and satnavs amongst other things. They have help funding the Skoda Fabia they use, by local businesses. They therefore undertake to do fund raising when they are able. Although many of the circumstances of their call outs were very serious, she related a few of the quite funny episodes that they have encountered. Effie also explained that sometimes it wasn't necessary for the patient to go to hospital and that what they needed was to be reassured, and to be made comfortable. Some of our members know from experience how calming it is to have them there within minutes while waiting for the ambulance to arrive. It was obvious that they have a very deep commitment to serving our communities and hopefully will go on doing so as long as they are able to. She did mention how difficult it was sometimes to recruit and retain people, not suprising when we heard what being a CFR entails. She was thanked at the end of her talk by Mrs Helen Williams. 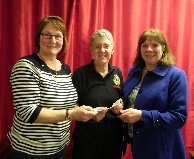 Our President Mrs Shirley Willis and Treasurer Mrs Helen Williams presented a cheque for £150 to Effie for the CFR group. This was the proceeds of the collections from our Group Carol Service, our Christmas Dinner raffle and the raffle from that evenings meeting. Our Competition of a slice of Christmas cake was won by Jean Lloyd, 2nd Helen Williams, 3rd Isobel Banham. The exhibition of a Christmas card of a Robin was won by Alice Wilding, 2nd Isobel Banham, 3rd Myfanwy Dulson. Next month our speaker will be Mrs Paddy Martin, the subject is "A Voyage of a Lifetime" the meeting is on 4th February in St Martins Miners Institute at 7.30 p.m. Visitors are always welcome. 28 members and friends enjoyed the annual Christmas dinner on 3rd December at the White Lion Whittington. Grace was said by Joyce Sands. After dinner our outgoing President Alice Wilding thanked everyone for their help in her 2 years as President and was presented with a thank you gift. Our new President Shirley Willis presented the exhibition cup and competition cup. Winners for exhibition cup were Shirley Willis 1st, Alice Wilding 2nd and Vicky Crane 3rd. The competition cup was won by Alice Wilding with Shirley Willis 2nd and Jean Lunt 3rd. Members were reminded that our Carol service will be held at St Martins Parish Church on 9th December at 7 p.m. and approximately 48 members from the W.I. 's in our Group are hoping to attend. Our evening ended with members enjoying a game of Irish bingo and a quiz. Our first meeting next year will be on 7th January at 7.30 p.m. at St. Martins Miners Institute. New members are always welcome. At our meeting on 5th November President Alice Wilding welcomed all members and 3 visitors. Our speaker for the evening was Mrs Karen Andrews who gave a talk in Victorian costume on bobbin lacemaking. She showed slides and had some old artifacts - bobbins in bone and wood, and implements they used in the Victorian days to make lace. She had some beautiful samples of old lace and lace she had made herself. They were very intricate and had taken many hours to make. Our competition of a pretty parcel for Dolywern was won by Jean Lunt with Morfydd James 2nd and Shirley Willis 3rd. Our exhibition of a lace doily was won by Paula King with Shirley Willis 2nd and Joyce Sands 3rd. After tea Shirley Willis presented her report of the meeting for next years Oswestry Show, which both she and Sheila Buchanan had attended, she informed us of the various subjects for our competitions that had been decided. At the following Annual General Meeting all committee members were voted in again with no new committee members. Shirley Willis was voted in as our new President. Pam Doyle will remain as Secretary and Helen Williams as Treasurer. Alice Wilding was thanked for all her work as President. Our Christmas meal will take place on 3rd December at The White Lion, Whittington which we are all looking forward to. Our Carol Service will take place on 9th December at the St Martins Parish Church with the other W.I. 's in our group. We didn't have a meeting in August, instead we had our annual outing and this year we had a very nice meal at the Hand Hotel, Llanarmon going by coach to take in the lovely scenery en-route. It was very much enjoyed. On 3rd September our meeting was presided over by vice president Shirley Willis. It was our 85th anniversary and the meeting started with the singing of Jerusalem. The Group Meeting was discussed, this will take place on 18th September at the Chapter House, St Martins and will be attended by the other WI's in our Group. We are having a chocolatier demonstrating their art and hopefully a sample to taste too yum! Shirley thanked Myfanwy Dulson for arranging our August outing and also thanked those taking part in the Oswestry Show. She gave an update about the First St Martins Show and gave out leaflets. Our speaker for the evening was Mr Richard Ashton a solicitor who gave a very interesting and informative talk on Wills and Powers of Attorney. Our competition of a photo of a tree was won by Pam Doyle with Vicky Crane 2nd and Julia Griffiths 3rd. Our exhibition of an old childrens book was won by Maureen Higginbottom and Vicky Crane 2nd and Shirley Willis 3rd. The evening concluded with games of blind whist. Mrs Alice Wilding presided at our meeting held on 2nd July. She welcomed Ann Jones from Whittington W.I. who attended the AGM in Cardiff as our link delegate. She gave her report informing us the resolution to "Protect our High Streets" and the amendments to our constitution were voted on and passed. She told us how much she had enjoyed the whole experience and how much she had enjoyed the speakers including Griff Rhys Jones and the presenter John Humphrys. Mrs Jean Lunt reported on our successful weekend catering at the Steam Rally at Park Hall, Oswestry. Names were taken for our trip on 6th August for a meal and a coach trip around the Glyn Valley. We will have no meeting in August. Our speaker for the evening was Lynda Worthy who gave a talk on the care of jewellery and she brought along a beautiful selection of Pierre Lang costume jewellery for us to sample and buy. She was thanked by Mrs Myfanwy Dulson. The competition of a single rose was won by Sue Stevens, 2nd was Shirley Willis, 3rd Helen Williams. The exhibition of a favourite necklace was won by Alice wilding with Vicky Crane 2nd and Helen Williams 3rd. The mystery prize was won by Pam Doyle. Our next meeting will be on 3rd September and our speaker will be Richard Ashton talking on Lasting Power of Attorney and Wills, all are welcome. At our meeting held on 4th February President Shirley Willis welcomed everyone including 2 visitors Melanie and Jill. The newsletter was read and our Spring Meeting at the Theatre Severn, Shrewsbury on 13th May was discussed. Various upcoming events were discussed and letters read. A thank you letter from Effie Cadwallader of the First Responders, St Martins for our donation of £150 was read. Our speaker for the evening was Mrs Paddy Martin who gave a talk and a slide show about her "trip of a lifetime" on the RMS St Helena which is the last mail ship operating between Britain, St Helena, Ascension Island and South Africa. This takes a mixture of freight and passengers, and is a life line as St Helena has no airport. These islands are not on the normal cruise ship agenda so it was fascinating to hear about them. Our competition of a holiday photo was won by Helen Williams with Alice Wilding 2nd and Ruth Dean 3rd. Our exhibition of a shell was won by Anglea Rea with Shiela Buchanan 2nd and Shirley Willis 3rd. After tea our Oswestry Show Committee was selected and our evening ended with a quiz which we all enjoyed and had fun with. On 4th March our speaker will be Mr Aaron Dean and he will be doing a "Antiques Road Show" so everyone is invited to bring along any air-looms they may have for valuation. We meet in the Miners Institute at 7.30 pm. New members and visitors are always welcome. At our meeting on the 4th March, our President Shirley Willis welcomed everyone including 2 visitors. We also welcomed a new member who joined that evening. Various items including our newsletter were read. It was decided that we would once again sponsor a student from the Derwen College on their sponsored walk. Our WI and Gobowen WI will man a stall at the Derwen Fete this year on 29th May. We were informed the WI resolution to encourage more organ donations will go forward to the AGM in Leeds this year. Our speaker for the evening was Mr Aaron Dean, a valuer and auctioneer. He gave an approximate value and talked about items our members had brought in. Afterward he gave a talk and showed us a number of antiques that would be going into auction soon and told us about them, we got some insights into what is sort after and what affects values, he invited us to guess on value before telling us what the estimate of that item would be. It was a very enjoyable evening and he was thanked by Shirley Willis. Our competition of 3 biscuits was won by Isobel Banham with Ann Sadler 2nd and Rita Jowett 3rd. Our exhibition of a glass object was won by Pam Doyle with Isobel Banham 2nd and Jill Doughty 3rd. Our next meeting on 1st April will be our Spring Show. Members will get the chance to enter their work in the cookery, handicraft, photography and floral sections. Lets hope everyone puts lots of items in, it should be a good night. Visitors are always welcome. President Shirley Willis welcomed all members to our meeting on 2nd February. We had a thank you letter from the Leonard Cheshire Homes for the Christmas gifts we had donated which said all the residents had enjoyed them very much. Our National Federation Annual General Meeting this year will be held at Brighton on 11th June and it is the turn of Oswestry W.I. to supply the delegate representing our group. Our Shropshire Federation Annual General Meeting will be on 19th April at the Theatre Severn and Pippa Greenwood of Radio 4's Gardeners Question Time fame will be the afternoon speaker. I'm sure this will prove to be a very popular event. This year we will once again be sponsoring a student from the Derwen College in their annual walk. Our speaker for the evening was Suzanne Ellison she gave a talk and demonstration on Energy Healing. This consists of tapping various points of the body. We all got a chart so we could try at home too. A bit like acupuncture without the needles. She was thanked by Barbara Aston. Our Competition of a photo of a bridge was won by Isobel Banham. 2nd was Helen Williams. 3rd was Shirley Willis. The exhibition of a pretty cup and saucer was won by Isobel Banham. 2nd was Joyce Sands. 3rd was Alice Wilding. The evening ended with a beetle drive. Next month our speaker will be Marcia Meredith on making paper flowers. At our meeting on 5th January 2016 our President Shirley Willis wished us all a Happy New Year and welcomed everyone including 2 visitors Lyn and Jude. The newsletter was read and discussed including observer tickets to our AGM at Brighton in June. Also some Bursaries that members can apply for. We had a display from Jean, Isobel, Gill and Ann who brought in 24 Fish and Chip jumpers they had made for new born babies in Africa who only have newspaper to be wrapped in against the cold, hence the name. Also on display were twiddle muffs made by Ann and Morfydd for Alzheimer patients at the Royal Shrewsbury Hospital. Ann informed us that £52 was raised at the Christmas meal raffle which will go towards our donation to the St Martins 1st Responders. Our speaker for the evening was Sandra Balmer a glass artist who displayed and talked about her work. She worked on a piece of stained glass to show us what is involved in creating such beautiful pieces. She was thanked by Alice Wilding. The competition of a slice of Christmas cake was won by Shirley Willis, 2nd was Jean Lunt, 3rd was Isobel Banham. The exhibition of a Christmas card with a snowman was won by Jude Williams, 2nd was Alice Wilding, 3rd was Jean Lunt. The evening ended with games of bingo. On 2nd February our speaker will be Suzanne Ellison on Energy Healing. Visitors and new members are very welcome.